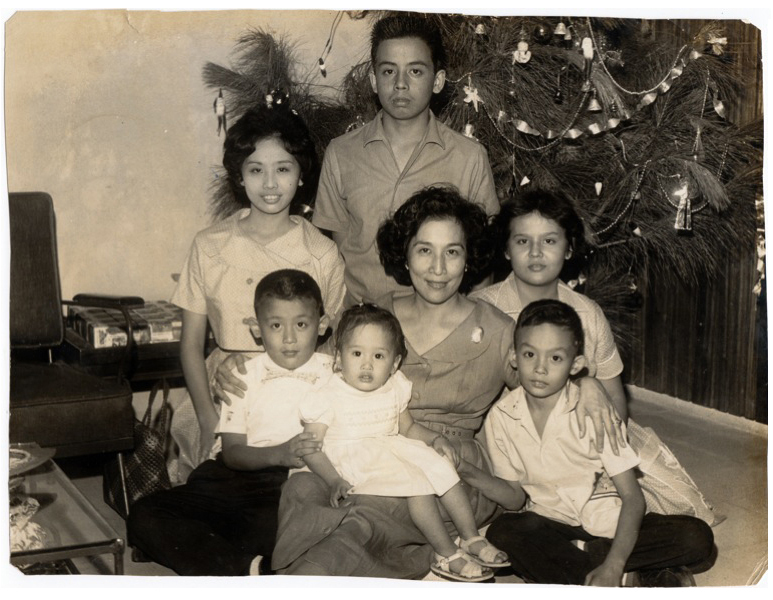 My cousin Joel sent me this photo of my Lola (grandmother) and her kids that I have never seen before. Her name was Leonarda – Lony for short. Doesn't she look fantastic?! I love that she looks so relaxed and elegant. My mom is the one to the right of my grandmother. I've seen very few photos of my mom at this exact age. It inspired me to write another post about my family history as a kind of follow-up to my post last year. Another thing that inspired me today is a comment someone left on my old blog about my ancestors. It was nice to be reminded of your ancestry. My Lola lost her husband, my grandfather Tomas, when he was only 51 years old. He suffered from severe asthma for years and eventually lost the battle. Back then, there were limited options for treament. I never actually had the chance to meet him. He probably took this photo, now that I think about it. My grandma was left to raise six kids on her own. From what I can recall, her family was fortunate enough to own several pieces of property in and around Manila. She earned a living collecting rent from tenants of several apartment buildings. I still remember going with my grandma to collect rent. Between raising six kids and managing property, she also spent a great deal of her time volunteering for an organization that helped the poor. I also remember accompanying my grandmother many times to visit the sick and the poor. Even as a child, I found this to be very humbling. She would always bring them baked goods that she made. She would sit, hold the hands of, and and talk with people who were sick. It was all very much a part of what my Lola was about. The Lola I remember was eternally (and fiercely) independent, generous, sassy and charming. She wasn't afraid to speak her mind. She had to. During the 60s until she passed during the 90s, she was on her own. It's also great to learn that she descends from a long line of strong women — matriarchs. This of course means that I, too, (along with my mom and her sisters) are part of this lineage. I realize that it's a big part of who I am, too. That's something that's to be proud of.